Actor Vishal is very well known for taking drastic steps in trying to reduce the effect of piracy in Kollywood. We have seen the star go straight to the streets and catch the shopkeepers who sell pirated versions of films, red handed. He used to do these acts even before he was elected as the president of the Producer Council. Now that he is holding two crucial leadership positions in the industry, the actor has been making massive moves to stop any harm from being caused to the producers and the film industry in general. Today, Vishal's Thupparivaalan, directed by Mysskin and produced by Vishal's VFF released worldwide and the action star has made a brilliant move by sending three people from VFF in various theaters to monitor the proceedings inside the screens. 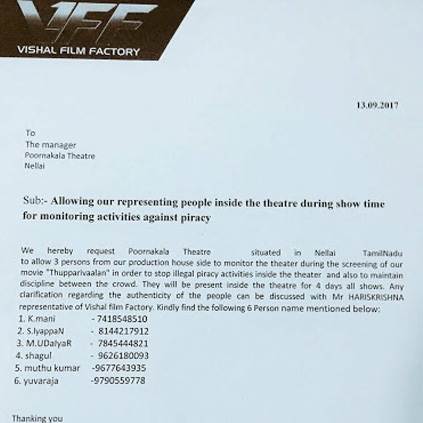 An image of a copy of the request letter submitted from Vishal's side to one of the theaters in Tamil Nadu was trending online, and we have attached that image above. When such impressive moves are made, it helps the industry majorly. GREAT NEWS: EVERY TICKET FOR THIS MOVIE WILL CONTRIBUTE TO FARMERS NOW! It is a known fact that Vishal is into a lot of charity work and has been doing good through his charitable organization, Devi Trust that helps children’s education and has been working towards women empowerment, urban development, etc. The latest initiative by Vishal is that, Rs.1 from every ticket bought for his latest film Thupparivaalan, will be donated towards ‘farmer’s welfare’ in Tamil Nadu. 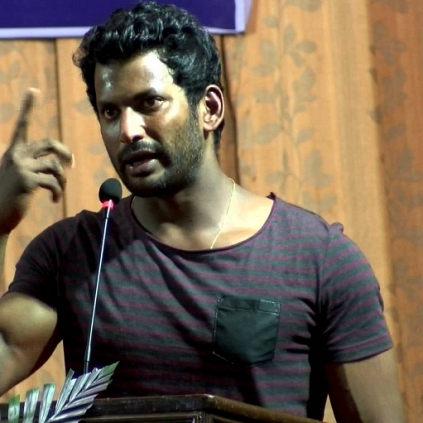 As he had promised earlier, actor Vishal on winning the Producer Council elections has decided that Rs.1 from every ticket sold throughout Tamil Nadu across the entire shelf life of the film in theatres, will go to the farmers and their welfare. A thoughtful initiative by the star. Thupparivaalan has hit screens today(September 14, 2017) and is directed by Mysskin. After the strike, it is this Arvind Swamy film first! Hot: Taapsee Pannu's bold bikini picture from Judwaa 2 is here. CBFC allows to use this word - Popular Tamil film censored finally! Rs. 1 From Every Ticket Of Vishal’s Thupparivaalan Will Go To The Farmers. People looking for online information on Thupparivaalan, Vishal will find this news story useful.